Mostly Books bookshop in Abingdon : "The Glastonbury of Food"
Too tired to do much blogging (in fact, I have strict instructions to get to bed now, as we've got another busy day tomorrow) but we just finished our day 1 of The Children's Food Festival. We are tired but happy - it was an incredible experience. There were doubters, and undoubtably there were a few things that didn't got to plan, but everyone who came along to the first day of this, the first ever food festival for children on this scale were fair blown away. 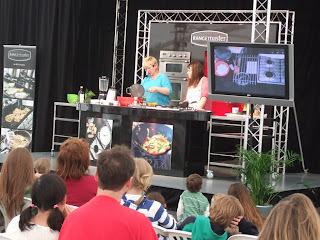 Stars of the day included Sophie Grigson (who compared the Rangemaster Cookery Theatre (1 500-seat audio-vidual live cooking demonstration theatre - awesome) and then demonstrated herself. 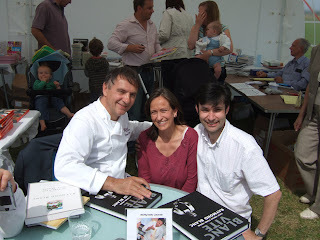 All the chefs who demonstrated came into the Mostly Books tent to sign books - and major thanks to Raymond Blanc, who sat in the baking sun outside the front of the tent and signed almost constantly for over an hour. And the kids that saw him (and joined him up on stage) were just bowled over.